Next → Next post: How many tram routes have low-floor trams? Yep, in terms of peak period travel to the city, trains are much faster, generally don’t get stuck in traffic, and you (the passenger) don’t have to find (or pay for) parking at the end. But trains are also costly to run and require a lot more staff than just one driver per train load of passengers. Unfortunately, politicians’ time horizon is only as far as the next election, so long term planning becomes someone else’s problem. Keep lobbying Daniel! 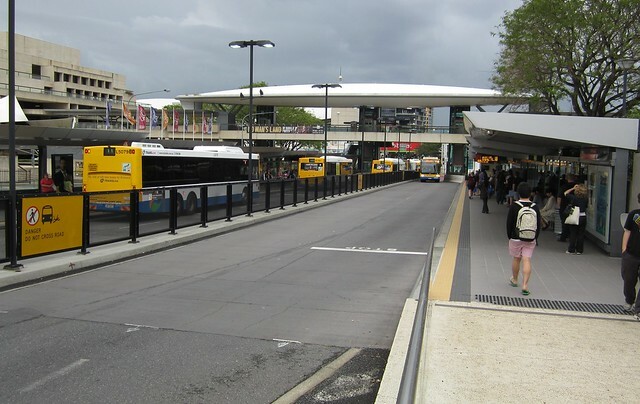 Were the Brisbane busways so expensive because they built entirely new paths for them rather than take an existing public road lane away from private vehicles? Also, they could presumably throw some rails into the busway and start running 60m+ trams on core routes if they needed to, and still have buses use the same roadway for lighter routes. While it looks bad in the photo, I expect Sydney’s buses are even worse. I’ve heard some of the times it can take to travel from the north to the south of the city and it is obscene. At least in Brisbane, there are some reservations that can be used for rail in the future. @Dave, yes, that’s correct. They’re like freeway-only buses — few (if any) traffic lights, for instance. One would hope they built them to cater for future rail; don’t know for sure though. The question would be whether the patronage from lots of bus routes (which branch out at the suburban ends and serve lots of different places) translates into higher-capacity light rail vehicles confined to just the bus/tramway. The question would be whether the patronage from lots of bus routes (which branch out at the suburban ends and serve lots of different places) translates into higher-capacity light rail vehicles confined to just the bus/tramway. If well planned timetables and interchange facilities were implemented there is no reason why the buses couldn’t continue to facilitate the same area, whilst having the advantage of reducing congestion along the busways which were converted to rail or light rail. Strangely enough in Brisbane, the core Busway routes actually operate at a higher average speed than the parallel heavy rail. Primarily due to fewer stops. They also run articulated buses on the busiest routes, and in reality the limiting factor is platform length, not vehicle length. Amazingly when it was originally built, that cultural centre station only had one lane (no passing lane) to allow for side by side light rail. At that stage a bus was passing though it every 27 seconds in peak, so they had to add the second lane. It was somewhat of a moment of realisation that the busway was already exceeding the capacity of the proposed light rail. And for about 1/6th the cost. The plus of the busway system is that services can bypass breakdowns (very rare) or accidents (again, pretty rare). They’re not fixed to tracks, and the majority of outer suburban services are run by different operators (but all with the same ticketing). They did build the busways to be able to take light rail, but you’ll need a very high capacity light rail system to match it. And then you need to deal with the fact that an extra change of mode is required, which is a massive disincentive. 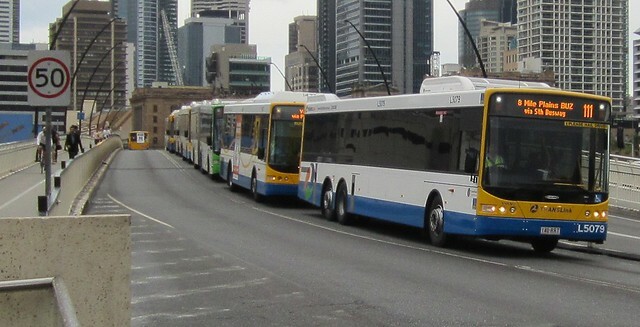 In some cases there are bus services that would require three connections (onto, off and then onto, and off again another busway), to replace the current single bus route. The $465million one km stretch includes an interchange with another busway, and two major stations (more substantial stations than any of Brisbane’s suburban heavy rail stations.). So it’s not $465million per km of busway itself. Also one of the downsides of higher capacity vehicles is the reduced capacity. Despite buses arriving around two a minute, you can still wait 15 minutes for some services that go to where you need to go. 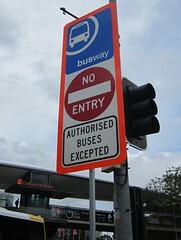 When the south east busway originally opened, the stop at the terminus only had buses every 15 minutes. 6-12 months later they tripled that to every 5 minutes due to crowding, and almost instantly patronage tripled (throw away your timetable, 5 minutes means you don’t need one). They then started adding express services to the point that it became much faster than either driving and cut more than 15 minutes off the equivalent heavy rail journey !